Papers: 1935-1972, approximately 20,000 items. 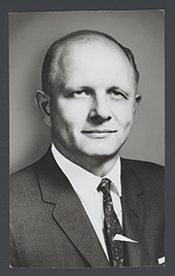 The collection of Richard Poff contains correspondence, speeches, press releases, legislative research material, questionnaires and newsletters, comprising Richard Poffs office files from his career as a congressman from Virginias 6th District; and scrapbooks, guestbooks, films of Washington Report, and tapes of campaign advertisements. Topics include agriculture, armed services, government appropriations, re-election campaigns, 1968 presidential campaign, railroads and highways in Virginia, watershed projects, crime and criminal law, federal aid to the 6th District, appointments and patronage, civil rights, states rights, electoral college reform, gun control, unions, labor reform, anti-trust laws, and voting explanations and tabulations. Congressional committees and commissions represented include Banking and Currency, Education and Labor, Interior and Insular Affairs, Judiciary, Post Office and Civil Service, Public Works, Rules, Science and Technology, Small Business, Standards of Official Conduct, Ways and Means, National Commission on the Reform of Criminal Laws, and the Republican Task Force on Crime. A finding aid is available in the repository and online. Papers: In the Robert H. Angell Papers, 1896-1981, approximately 130 items. Correspondents include Richard H. Poff. Papers: In the of Frederick William McWane Papers, 1912-1961, 5 linear feet. Correspondents include Richard Harding Poff. Papers: In the William B.Spong Papers, 1957-1988, 35 linear feet. Other authors include Richard Harding Poff. Papers: In the Ted Dalton Papers, ca. 1933-1978, 14 boxes. Prominent correspondents include Richard H. Poff.